Is there any way of knowing before it happens? How do you know if and when the market has topped? When the Sacramento area real estate market changes, does it happen all at once? Everywhere at once? How long does it take before you can really tell for sure? Is your area’s real estate market beginning to shift? The most difficult thing about a Real Estate Market shift is we NEVER know for sure whether we are in a slight market adjustment or a major market retraction or just a coincidental series of market events, until there is an undeniable amount of evidence. And by then, the shift is over… the evidence comes after the fact, AFTER you can do anything abut it. What are the signs BEFORE A DROP IN PRICES? Real Estate Data happens AFTER the transactional instances that create that data. 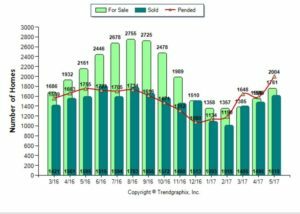 Absorption Rate, Days on the Market, Months of inventory. These are usually more easily seen and measurably noticed earlier than changes in average prices or median prices. But remember too, that they are all measurements of events. These events/actions happen one at a time… One home, one family, one triumph or one calamity at a time. How would you know if we are beginning a real estate market change? A“shift”? The answer is in the numbers, the reports that MLS data and public records provide. What are THE 4 SIGNS OF MARKET CHANGES? Basically, there are just more homes for sale- watch for a higher trending number of ACTIVE LISTINGS and Months Of Inventory. This just means more supply, less demand. (As basic as it gets.) -see definitions below for more info. …or in other words, going all the way through the listing period UNSOLD. (typically either 120, 180 or 365 Days). See above. …as inventory increases, and there are more choices, buyers simply take longer to see all their options and make a decision… and no longer feel the same URGENCY to act quickly, pay higher than list price and compete time and again to buy a home. This will always coincide with a higher percentage of homes that go through a price reduction in list price before actually selling. Also ALWAYS an increase of homes “back on the market” which means more failed escrows. -see definitions below for more info. This is not always obvious, as the original price is not typically shown to the consumer. The asking price at the time the accepted offer is the number seen by the public. The original price can be harder to find. SOLD PRICE/ORIG. LIST PRICE DIFF. % When a property is listed on the market, the list price may change couple times before it gets sold. The original list price is the price that is first entered to the MLS database when a property is listed on the market. The Sold/List Diff. % represents the percentage difference between actual sold price and the original list price the day it initially was marketed. What’s happening in your area? Do you know? This entry was posted on Friday, June 30th, 2017 at 10:49 am	and is filed under Options for Home Owners, Options To Foreclosure, Posts for Pages, Selling Your Home. You can follow any responses to this entry through the RSS 2.0 feed. Both comments and pings are currently closed.